Personal computers, or PCs, are now a standard tool in everyday life, with a penetration rate of almost 80 percent in U.S. households as of 2013. PCs originally emerged in the form of desktop computers, which were small enough to sit in the family home or an office, but were hardly portable. However, the definition has since been expanded to include laptops, notebooks, netbooks and, since 2010, often includes tablet PCs (or simply 'tablets') and other hand-held computers. As of the fourth quarter of 2015, the leading PC vendors (excluding tablet producers) were Lenovo, HP Inc (nee Hewlett-Packard), Dell Inc, Apple Inc, and Asus. Over the last couple of years, the Chinese computer technology company Lenovo has overtaken Hewlett-Packard as the market leader in terms of worldwide PC unit shipments. 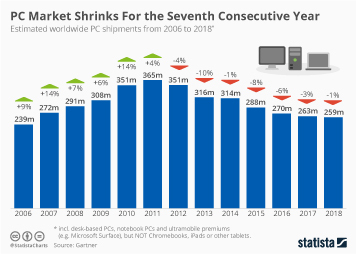 According to Gartner, total shipments of PCs worldwide amounted to around 290 million units in 2015, a decline of 8 percent compared with the previous year. The first tablet PC to experience widespread commercial success was introduced to the market in 2010 by Apple. The iPad, along with the other tablet brands that soon followed, have experienced rapidly increasing demand. While around 20 million units were sold in 2010, that number has increased to more than 205 million in 2015. An forecast for tablet sales predicts that global shipments will reach 263 million units in 2018.